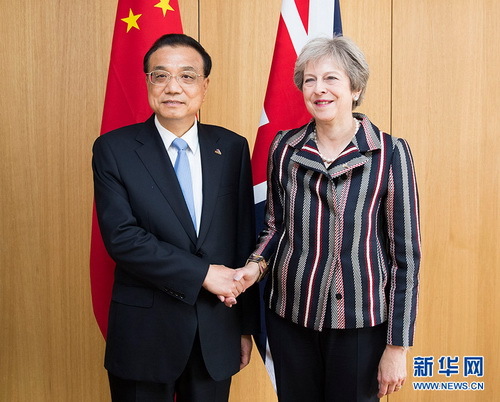 BRUSSELS, Oct. 19, China welcomes Britain to seize the opportunity arising from its further opening-up and bring the mutually beneficial cooperation to a new height, Chinese Premier Li Keqiang said on Friday. Li made the remarks when meeting with British Prime Minister Theresa May on the sidelines of the 12th Asia-Europe Meeting (ASEM) Summit in the Belgian capital Brussels. The annual meeting between the heads of government of China and Britain at the beginning of the year injected new impetus into the bilateral ties and pragmatic cooperation, Li said. In particular, the two sides reached consensus on speeding up the Shanghai-London stock connect, which shall make Britain the first country to connect its securities market with the Chinese market, said the Chinese premier. Li said China is willing to work with Britain based on the principles of mutual respect and equality and boost mutual trust so as to create a favorable environment for boosting the bilateral cooperation. China will continue to further open up and expand access by foreign businesses to its market, including industries such as finance and services, the Chinese premier said. He said that China welcomes Britain to seize the opportunity and expand cooperation with China in economy and trade, finance and manufacturing, as well as in jointly exploring third-party markets, bringing the mutually beneficial cooperation between the two countries to a new height. For her part, May said Britain sees its ties with China as an important part of its global partnership. She said she is looking forward to Li's visit to Britain for the next meeting of British and Chinese heads of government. Britain welcomes China's further opening-up and is keen to continue promoting the sustained and healthy development of bilateral economic and trade relations through mechanisms such as the China-UK Economic and Financial Dialogue, she said.